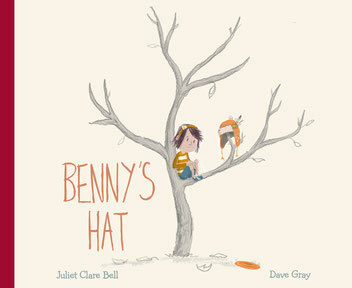 Benny's Hat is a story about child bereavement. Before writing the book, we worked creatively with bereaved and pre-bereaved children, young people and families, and young people with life-limiting conditions. They created their own stories, too, which we turned into books for them to keep. These families also read and gave feedback on early drafts of Benny's Hat to ensure that we were creating an authentic book that was respectful and felt relevant to bereaved and pre-bereaved families. We worked with families from Edward's Trust, Acorn's Children's Hospice and Child Bereavement UK and we are extremely grateful to all the families, individuals and organisations concerned, including the Arts Council, with whom we won a grant for this project and to create the book. Here's a link to a blog post I wrote with some background to why and how we made the book this way. Jackie Grant, Bereavement Support Practitioner, Child Bereavement UK: "Benny’s Hat deals so quietly with a huge subject of a sibling dying, from the view point of the sister. It shows beautifully how children and young people might deal with serious illness and death differently to adults. The story gives adult readers examples of how to support children when a sibling is not expected to live, not only from the section for parents at the back, but also by watching Friz’s parents’ reactions to her behaviour. I think this book will be extremely helpful for me in supporting families, children and young people through pre- and post-bereavement." ...the different emotions Friz experiences - grief, anger, confusion, fear and above all, love -are beautifully and movingly told by Juliet Clare Bell. Friz's voice is so authentic -we really feel we know this little girl. In another clever layer, Dave Gray's tender and sensitive illustrations show how the story is unfolding and how each family member is feeling. ... I believe this quietly beautiful book will be a really valuable starting point for further discussion with children about a painful and difficult subject". Liza Stevens, foster carer and author of 'Not Now, Celeste'. "...such a lovely, touching story taking on a difficult subject whilst capturing the innocence and lightheartedness of childhood... a really useful book for all primary schools"